Yuuhuu..Alamak nak berkulat dah blog restnrileks ni. Sorry people. It has been a while. Currently i am swarmed with works. So, today, i ve decided to post something after being "nudged" by one of my fellow bloggers, asking me to update my post. The first one is a quick illo which i haven't got time to finish. It was supposed to be for last week IF theme - "worry". However, as i drew, i changed it to something else and therefore, passed last week theme. Hey!! I still manage to fulfill my weekly quota of one Illo per week right?. : ) So, here it goes : Miss Jha'leen is having fun dancing with other mythical creatures deep in the forest. She just goes to her favourite spot, far from the rest of the community, and dance all her way. No worries about having to be a ladylike fairy. Huhu.. Yeah you go girl!! 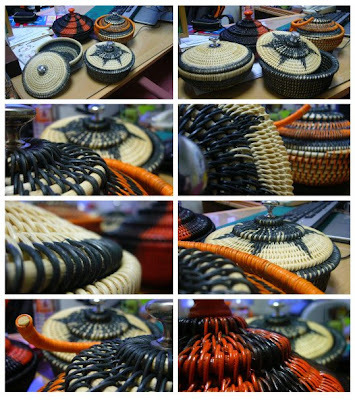 2nd is a collective pictures of another rattan crafts - Rattan Basketry Coiling Technique. Just few variations on different colours used. Idea development on form has not been carried out yet. Basically, these baskets still retain the basic form. Nevertheless, using colours and patterns do tell us how to improve and pay attention on certain areas. We also agree that certain types of dyes should only be used when applying coiling technique. So, in the future, we hope to come, at least "okay" when trials on forms take place. (Though we know making certain dynamic forms would not be easy as ais kacang.) Ohhh.. please do not pay attention on my working desk..yeah i know, it is a bit messy. Hehe. 3rd, is a sketch done by one of my final students (NorAmin), which i really hope will turn well as a product. "From concept to reality" as we always say. If not, then i guess we will have a good laugh then,haha. Alas, though we have counted every aspect in terms of design, there are always still possible unforeseen circumstances that may arise. (Harap2 idak la). 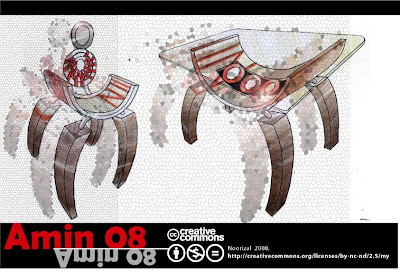 This is a design of dining table of four - Modern Artistic Piece is the direction. The legs will be weaved using spiky technique (not shown in the picture). Single Weave (Anyam satu) will be on the back rest. The Seat and the table top will be weaved using various techniques to create certain pattern. Colour theme : Black and orange. Material used - Wood, Metal and Rattan. The design is somewhat difficult to construct since we have reduced the basic supports and replaced with certain ways of jointing. The illusion is to have it look not sturdy enough for its lack of supports (legs might wobble for chairs and table), yet, still sturdy. Hopefully, our calculations would be right. Kalau tak, habiss. I ll post the finish piece in three weeks time from today. Phatelara - Udah update blog ni dan siap bersih2kan sawang kat blog ni lagi. Bau wangi tak sebab dah spray dengan ambi pure blog ni tadi.. hehe..
Bro Zubli - Sorry tersilap taip..bukan Rizal yang kena assess..tapi Rizal yang assess budak2.. Haha.. Result , Rizal pasti repeatkan 3 orang pelajar. Hehe. So, there you have it. My quick three-type story for this post. Heppi blogging and have a great day everyday yaa.. Thanks for updating ler, Abg Rizal. =) Suka tgk kraf rotan dan illo sumer. Great job! akhirnya, bersih jugak sawang2 kat blog tu. hehe..
Selamat menyambut Hari Gawai yerr..
Terima Kasih sebab bagi ikan rizal makan. rizal pun sendiri dah lupa nak bagi ikan tuu makan hehehehe..
saya suka lengan baju miss jha'leen. dan elf dua ekor itu. hehe. teruskan berblog tentang rotan ya! keep up the good work!! 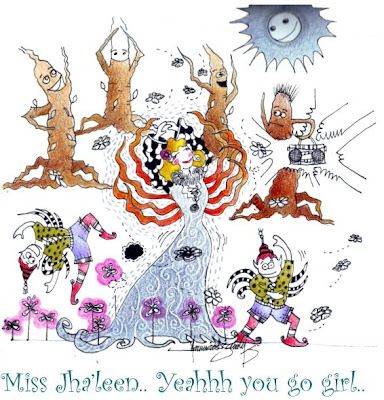 Miss Jha'leen looks so happy...and the tree characters are very cute! your student's furniture design is great...hope the executed piece turns to be so good! thanks.. thanks for keep coming back here.. yeah i know that i havent been faithful during these few days since i am warmed with works.. but bear with me ya..
p/s: miss Jha'leen says "hi.."
Thanks. Miss Jha'leen says hi and "Apa Khabar?" Salam Rizal! Oh I like this one. Awak are a good artist. Saya have been out in the middle of nowhere on this journey in the truck. But, I am trying to get caught up today. Sailahlah forgive me for missing a couple of days. bakul rotan tuh looks awesome..!! bagus la design si kmbar(amin),dulu dia mule2 msyuk ikn cm terpksa je ambk kos rotan tp skang alhamdulillah power gak la design dia ek. apepun tahniah la kt si kmbr tu...drpd x senior dip 2005.